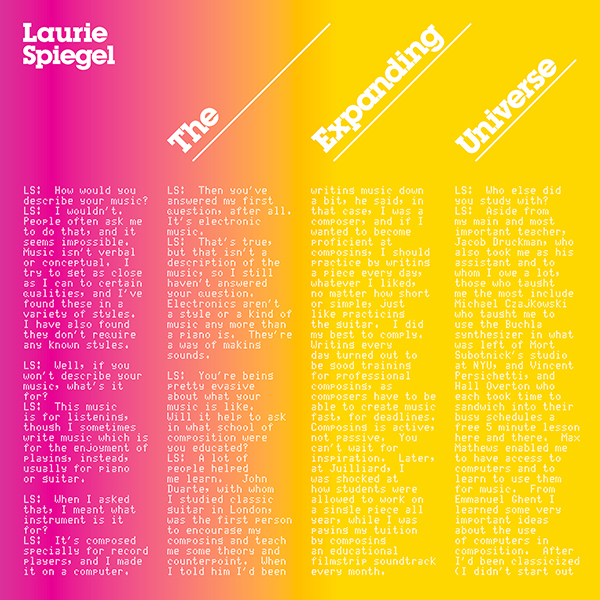 Brainwashed - Laurie Spiegel, "The Expanding Universe"
Laurie Spiegel, "The Expanding Universe"
This is a terrific reissue of pieces Spiegel created at Bell Laboratories between 1974-77 when computers were as big as fridge-freezers. Included with her landmark 1980 LP are 15 superb additions, including the entire Appalachian Grove series and "Kepler's Harmony of the Worlds," her contribution to the golden record launched aboard the Voyager spacecraft. The Expanding Universe is a pioneering work in the fields of music composition and computer programing. Just as important, from the musical perspective, it is infused with an obvious appreciation of John Fahey's radical guitar instrumentals, in particular, and J.S. Bach. It was processed with the Generating realtime operations on voltage-controlled equipment (Groove) hybrid system developed by Max Matthews and F.R. Moore at Bell labs. Spiegel was fascinated with analog synthesizers in the late 1960s and already had a degree in music composition when she began trying to combat some creative frustrations inherent in the limitations of technology. On a basic level these included lack of memory, the rules of logic, and the degree of spontaneous interaction between human and computer. In video interviews Spiegel comes across like an exceptionally charming astronaut: super sharp, humble, expressive, and excited by exploration and expression. Her explanations are clear and intelligent to the point of being seductive. In this same period Laurie Spiegel also created one of the first paint programs as later she designed "Music Mouse - An Intelligent Instrument" for Apple, Amiga, and Atari computers. Her apparent disillusionment with the focus on product over research and experiment put her off the electronic-computer music "scene" and she supported herself by programming and teaching mainly, although her music has been used in movies and television. She reminds us that computers were envisaged as labor-saving devices and in a musical application this allowed for easy repetition of melody and rhythm and for the composer's intentions to be amplified and increased beyond their imagining. In terms of how The Expanding Universe was created, Spiegel refers to a "synergistic oscillation" between what the technology suggests to the artist and the original creative need or vision the artist brings to the technology. She insists that this principle is no different than writing for an instrument such as violin or a drum. Back in the lab, the move from analog to early digital systems, with stepwise incremental capability, eventually allowed Spiegel "freedom to define any world you wanted, and work within it." My description of her video interviews applies equally to her music: very clear and intelligent, with a humble yet profound spirit, where nothing is disguised or exaggerated for gimmick. These pieces retain a revolutionary freshness and an honesty of which Fahey would be proud. They also reflect an appreciation for nature and Spiegel's ability to play banjo and lute. The limited edition LP on transparent vinyl is likely to become a collectors item. "Folk Study" is added to the original tracklist of "Patchwork," "Old Wave," and "Pentachrome," on side A. 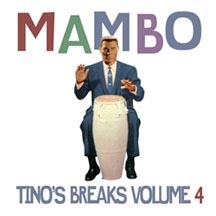 "The Expanding Universe" is on side B. It comes with download codes for the whole 19 track CD set. Both include a 24 page booklet featuring Laurie Spiegel's notes and period photographs. This is a sensational release.